I'll admit – I begged Jaylyn to let me sit down and grill her about her upcoming epic trek. You all need to hear about it. Nuumo Poyo is better known as the John Muir trail, but long before that, the way was carved by people of the Paiute tribe. It's part of the Pacific Coast Trail now, and Jaylyn and ten other woman through Indigenous Women Hike will be setting out to travel 210 miles across this ancestral route, a journey they see as a way of honoring their ancestors and reconnecting with a landscape once inhabited by others. If you Google "Nuumo Poyo" less than five results come up. 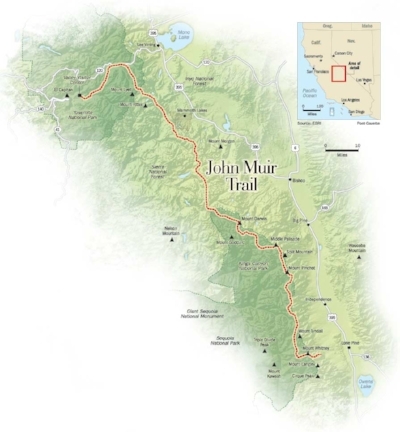 The name certainly doesn't translate to "John Muir" – it means People of the Trail or Road. It was once a trading route regularly traversed by the Paiute people. This nomadic tribe relied on rice grass and pine nuts for food, wove baskets, and used blowguns as weapons. So Jaylyn, what is the significance of this trail to you today, as a Navajo woman who's been sort of rediscovering your roots and finding your identity as a Native American? This trail means so much to me, it's something I can stand with my Paiute Sisters and support them as they're reclaiming the trail of their ancestors. And who initiated this hike? Do you have sponsors? Our fearless leader, Jolie Varela, from Bishop, CA. This is her ancestor's trail, her land, and her People. We have some AMAZING sponsors who are committed to our hike! Deuter has provided us with beautiful backpacks! Vasque has given us shoes. The North Face, rain jackets and tents. Big Agnes has given us a great discount. There are so many people we have to thank! Can you walk us through some of the basic logistics? Where do you start and end? How long will it take you? We begin the trail on Wednesday, August 1st and we estimate to be done on Sunday, August 26th. We start in Yosemite Valley at Happy Isles and hike the 210 miles to Mt. Whitney, 14,505. So, 210 miles on foot is going to take a while. What do you think you'll be thinking about as you walk? Such a good question...I'm definitely a processor in the Wild, I think of everything. I also find so much of myself and who I am. I imagine there will be a lot of soul searching and finding myself. I'm pretty excited about this, however it also makes me nervous. Who wants to encounter your true self, it could be good and yet scary. I think in my own ways and on my own walk, I'll be reflecting and thinking of my own Ancestors (Navajo) and their own walk, The Long Walk and to open my heart to this piece of history. How have you been preparing for the trip? I have been training so hard. Each week, I've been hiking a couple of hard hikes here in Boulder, Mt. Saints and Bear Peak. Each with 25 - 35 lbs of sand bags in my back. I'm also doing a lot of weight lifting. But I'm also prepping mentally. It's been so hot here in Boulder and there are many times after work, where I just don't want to go hiking in 95 degree weather. But I force myself, there will be many times on the trail where I just don't want to keep going, but I have to...one foot in front of another...dig deep. I've also asked family and close friends of mine to be in prayer of the trip, safety, and my own training. What do you expect will be some of the biggest challenges? For me...pooping outside. Yup, I said pooping! Is there a spot on the trail you're most looking forward to? I'm really looking forward to hiking Mt. Whitney...and the elation of completing the trail with such a badass ending! What about something you're dreading? Have I mentioned pooping outside? Struggling with my mental psyche...the words, "you can't do this, you're too weak, give up." A beer or margarita! I'm excited to see how my mind will shift with personal stories in my own life. How much closer I'll be with my Creator. I'm excited to work through the various road blocks in my life. I know a pile of people who will NEED to know this: How can we follow along with your progress?! We will be adding a page to our website to watch our progress through our Gamin! Join us! Jaylyn and the team have set up an REI registry and they have a bunch of outstanding items they need purchased to help their trek go smoothly. You can pick out an item for them to pack along at the button below. If you'd like to help with other expenses of the trip, you can check out their GoFundMe page.